"The tale of the seven winds island". A wonderful fairy tale – for you only. 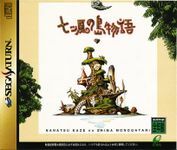 An ultimate digital edventure story book, that is "The Tales of the Seven Wind Island". A picture book where there is no Game Over, where there is no combat. But there is air and light, and another world populated by strange inhabitants filled with life. Your job is to create one book with a story. What you have seen with your friends, what you have felt, what you have experienced, that will all be told in the picture book your are creating. There is no game over. Search and find the story for you and you only, in the mystical world created by Keita Amamiya. User note: Keita Amamiya is a famous special effects designer and illustrator.